As a respected master in the design and manufacturing of high-performance boats, Mark McManus has created offshore boats that range from 20 to 65 feet in length and reach speeds in excess of 110 miles per hour. Mark McManus Inc., doing business as McManus SuperBoats, was the only superboat builder in the world to have built boats that flew these prestigious colors: Cigarette Racing Team, USA Racing Team, Apache Powerboats, Squadron XII, U.S. Customs and Halter Marine. McManus has always catered to a very specific target market, but now wanted to make a special effort to introduce his new line of Apache Powerboats to the general public in a larger than life way. To reach a laser-focused target market of those who had the propensity to purchase go-fast boats, the Agency created an oversized brochure that would be an important resource for potential customers during the three-day McManus SuperBoats Boat Show, taking place the same weekend as the Fort Lauderdale Boat Show. It would have to be the kind of collateral that would turn heads and grab target audience’s attention. The intent of the brochure was to make a lot of impact – and the piece was designed as such. The contemporary and dynamic design showcases the boats, their technical blueprints, and a brief history of the legandary McManus SuperBoats and Mark McManus. The 15.5” by 19.5” brochure included a pocket, unique binding and a cover that doubles as a poster. It was placed in a red portfolio case and distributed to prospects at the Fort Lauderdale Boat Show, alluring them to visit the nearby McManus show. Three boats sold for upwards of $800,000 each. 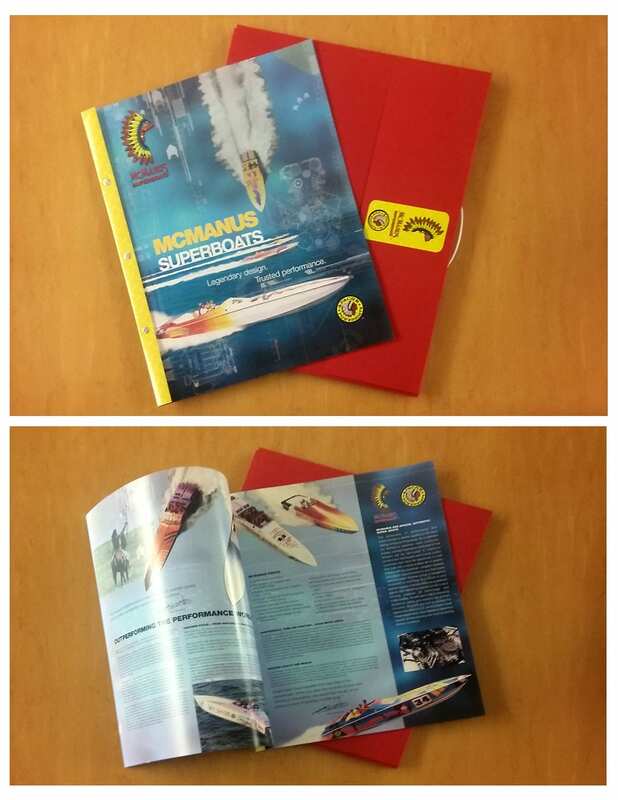 The client was thrilled with the outcome, and throughout the year McManus’ customers and prospects had many positive comments about the “super” brochure.